After my disappointing purchase of the iCase Leather, which I reviewed a while back, I immediately decided to order another case for my iPhone 5S. 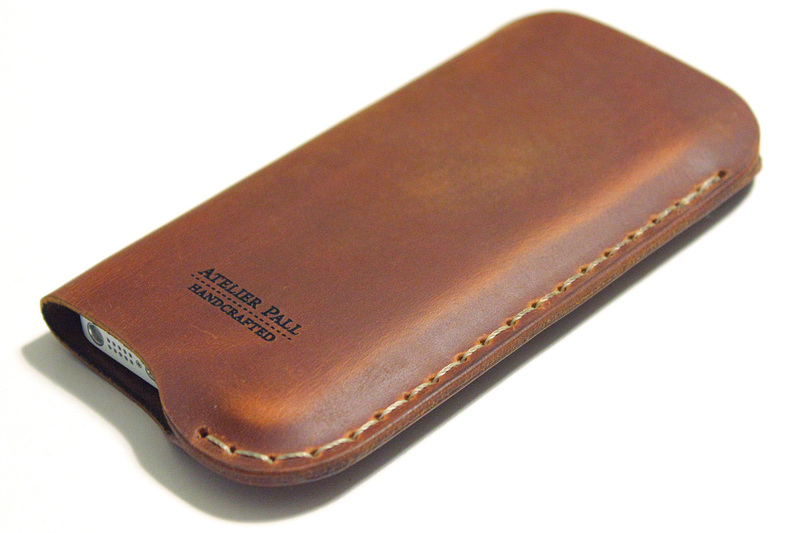 This time it was an Atelier Pall Leather Sleeve, in brown. 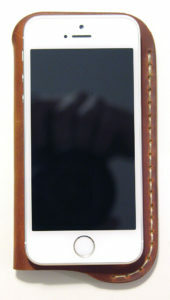 I had read about it in the same thread on MacRumours as where I found out about the iCase Leather. 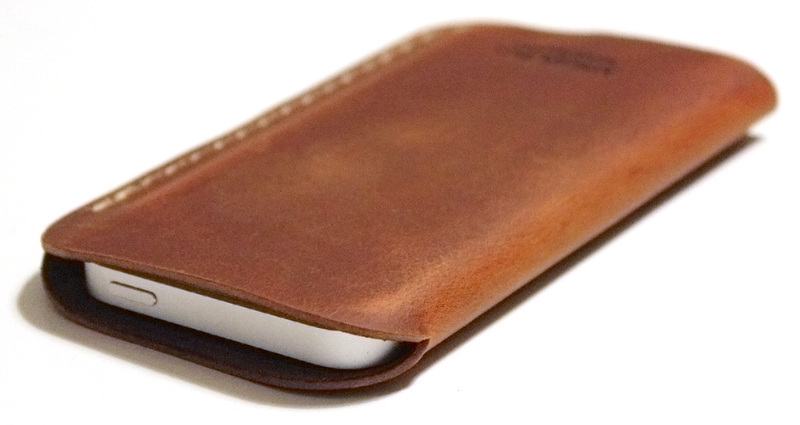 I have used this leather sleeve for six months now and thought it was time I reviewed it. The ordering process went smoothly and delivery was quite quick. It took only five days to Sweden, by regular mail. 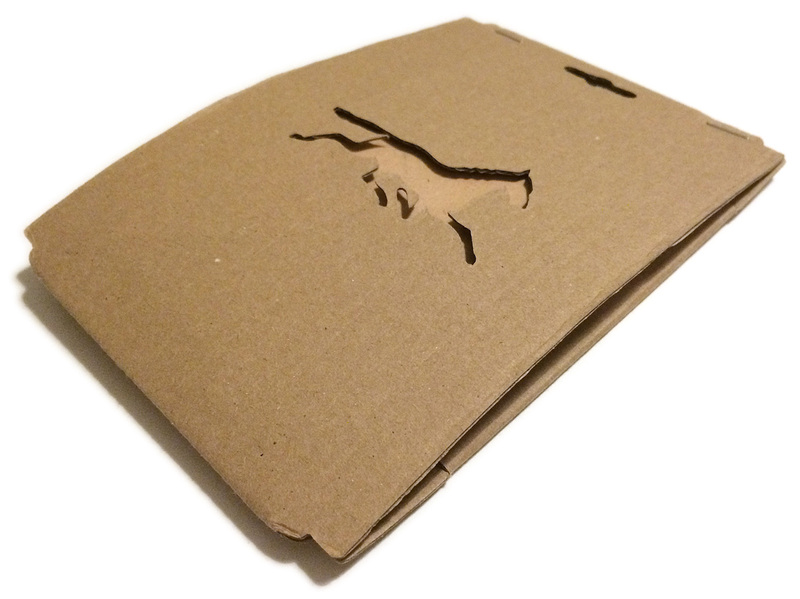 The packaging was a folded plain corrugated fiberboard with an Atelier Pall logo cut-out on the front. Simple, but I liked it. 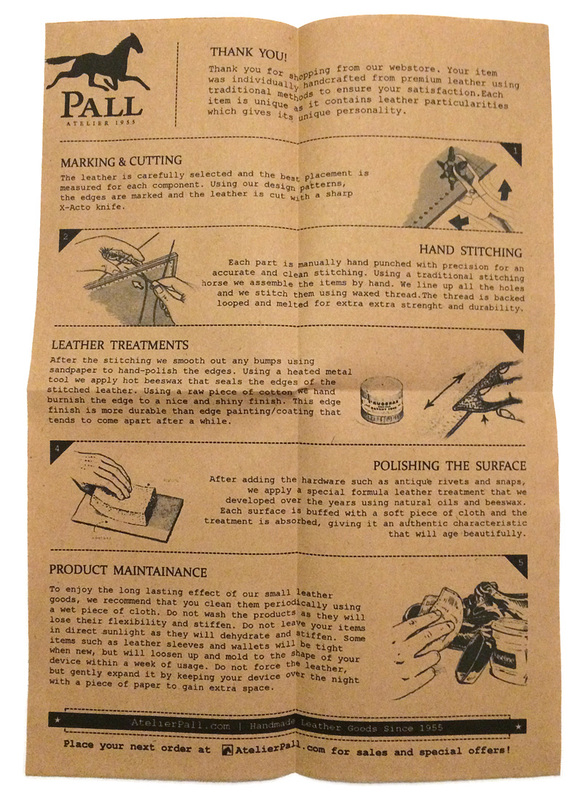 Inside, in addition to the sleeve, is a sheet with information on how the product was made and how to take care of it, printed on rough recycled paper. The sleeve, and the complementary headphones cable organizer (see below), was protected in wrapping tissue. All in all a pleasing package. The texture is very smooth and the smell is a rich leather smell, like walking into a shoe store. No doubt this is pure leather, as opposed to the previously reviewed iCase Leather. Directly out of the box. The color was a bit darker and more red than I had expected from seeing the photos on atelierpall.com, but there is definitely nothing wrong with it. The leather is about 1.5 mm thick, pull up leather, which makes it lighter in color where it is stretched. You can easily see the effect in the photo at the top of the page which has the iPhone inserted and compare it to the photo of the sleeve right after I had unpacked it. Straight out of the box the leather isn’t very soft. But if you bend and work the leather a bit it softens up and then when the leather contracts it stiffens again. The sleeve is very sensitive to scratching, but small marks disappear after some light rubbing and normal use. I see this as a feature, as it has made the sleeve more personal the more I have used it. The sleeve has no fabric or suede lining as many other sleeves have, it is just the leather. But it is soft enough to not do any harm to the iPhone. The Atelier Pall logo is laser engraved on the front. In fact, you can have your own engraving on the back. I contacted Atelier Pall via Twitter to see if they had any example images of the result of this engraving, but they didn’t. I was considering having my case engraved just for fun, but was worried about which typeface they use. I didn’t want to end up with my name in Comic Sans! However, explaining my worries to them I was told I could use any Google Fonts font and that it would work with their laser engraver. This opened up a wealth of possibilities, so many in fact, that in the end I decided to just go ahead and order it without engraving. Most of Atelier Pall’s products are wallet type sleeves but they offer two basic sleeves that does nothing more than hold your iPhone. The one I got has an opening at the bottom to help you push out the iPhone. Just trying to pull the iPhone from the top can be a bit tricky since the sleeve is tight. This design, compared to the other version they are offering, helps to keep the width of the sleeve down, since the stitching is only on one side. The stitching is done with a strong thread and has so far held up. In addition it is possible to charge your iPhone and use headphones while in the sleeve. As I mentioned earlier Atelier Pall also included an earhones cable organizer. It has gotten more use than I initially thought it would. You first wrap your earphones cable around three or four fingers and then lock the leather flap around the cable bundle. It is extremely simple in its design but gets the job done beautifully. 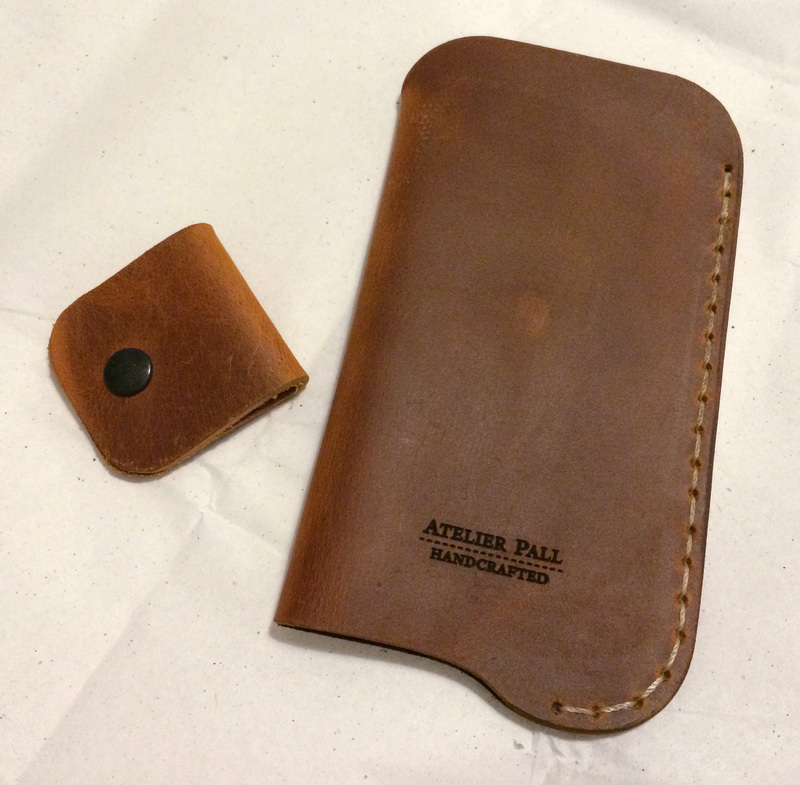 During the six months I have been using the Atelier Pall Leather Sleeve I have experienced no problems with it. Sometimes it gets a scratch but in a couple of days it has disappeared. Its rounded edges and texture give my iPhone a good grip when I carry it. It has a simple design and the material and workmanship is of excellent quality. It has opened my eyes to good leather products and I have been thinking of perhaps ordering a regular wallet from Atelier Pall, to match my iPhone sleeve. And I wish they had something for my Macbook Air! – You will have to remove the iPhone from the sleeve to use it, just like any other sleeve. – If you have dirty pockets a grain of sand might get sandwiched on the inside and cause a scratch when removing the phone. This goes for all sleeves of this type. It hasn’t happened to me though. A cool review from one of the coolest clients! very honest an thorough and honest!